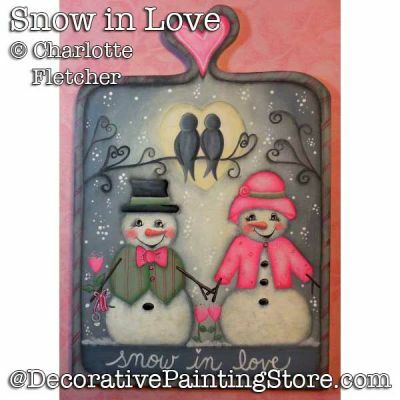 Snowman couple on wooden paddle. Snow in love takes you to a grey summer night, where love is in the air. Lovely grey tones are created with DecoArt Americana Acrylics. Line drawings, a colored photo and complete written instructions make this pattern packet a fun project that is sure to warm you. Surface available from Bear with Us, Inc.